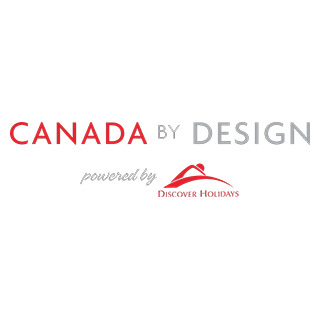 As Canada travel experts, we live and breathe designing custom vacations in our country. Doing what we do for nearly two decades, we've seen a rise in popularity with the winter months, and it isn't hard to see why. Think crackling fires, cozy lodges, sparkling snow and frozen waterfalls – in essence, your opportunity to see this magical season at its best. Still not sure what to expect? Let us reveal our most popular winter trip: the Snow Train to the Rockies. Read on to watch the video and get the full details on our travels. 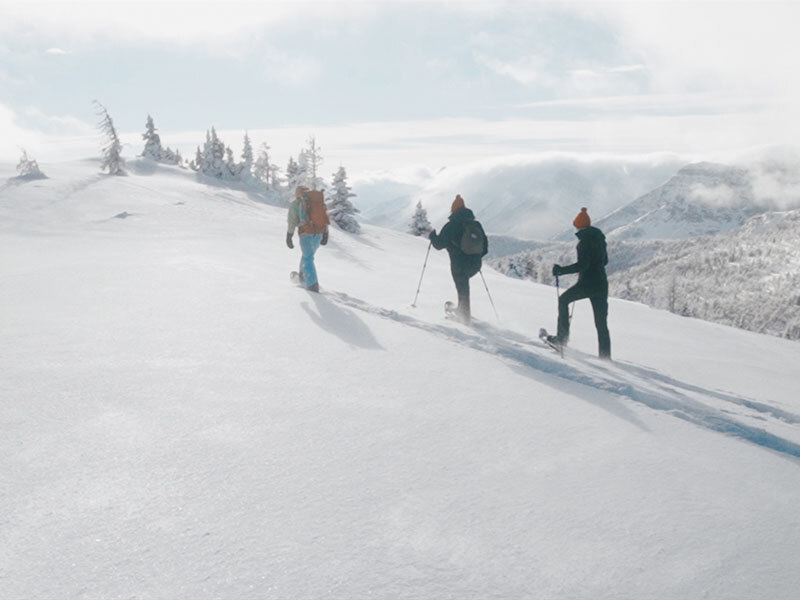 Beginning in Vancouver and ending in Calgary, this video takes you with us through a snowy winter wonderland as we go ice climbing, snowshoeing, heli touring and more, shedding light on what the trip entails and what you can expect. Click the play button above and read on for the itinerary, keeping in mind that all the details are completely customizable. Most of our travelers book an extra night in Vancouver so they can spend a day exploring before departing on the train. Naturally, we followed suit. Flanked by coastal mountains and surrounded by ocean, this shimmering city has been consistently rated as one of the most liveable in the world, and today is your opportunity to see what makes it special. Beginning the day at your downtown accommodation (we chose the Opus in trendy Yaletown), it's just a short walk to the free shuttle to Capilano Suspension Bridge Park. Crossing the Lions Gate Bridge and watching the towering skyscrapers shrink behind you, the North Shore greets with cool evergreen forests and the famous Suspension Bridge, Treetops Adventure and Cliffwalk experience. Grab a hot chocolate and take your time to explore, then head back downtown for a little evening excursion. When it comes to shopping, drinking or dining in Vancouver, the historic Gastown neighbourhood is a dependable go-to. In this video we visited the Belgard Kitchen, an industrial-inspired space serving up mouthwatering share plates. Craving a crowd pleaser? Order the Wagyu meatballs or roasted mushroom pizette, paired with a delicious wine or beer flight of your choosing. 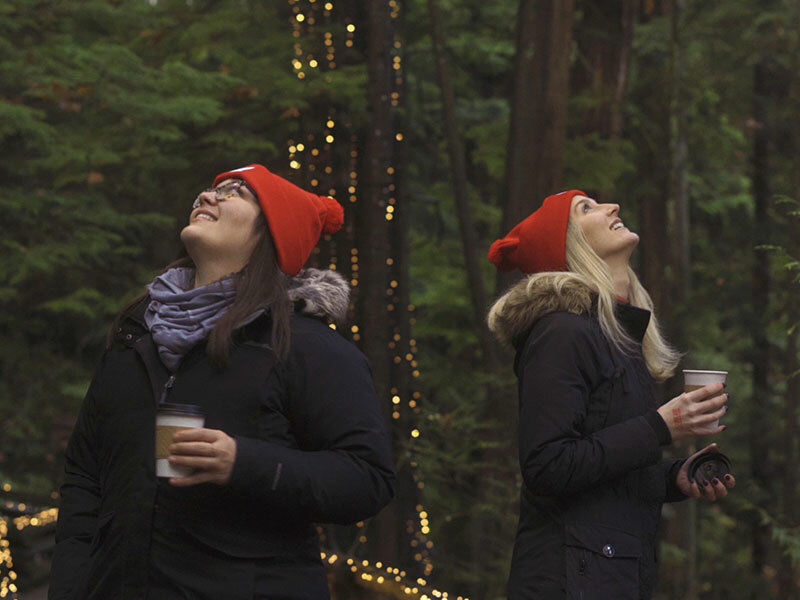 Customize it: Already checked the Capilano Suspension Bridge off your list? Eat your way around Granville Island, take a brewery tour or go for a snowshoe and fondue tour on Grouse mountain. Waking once again to your downtown accommodation, make your way to Pacific Central Station and board the train bound for the Rockies. 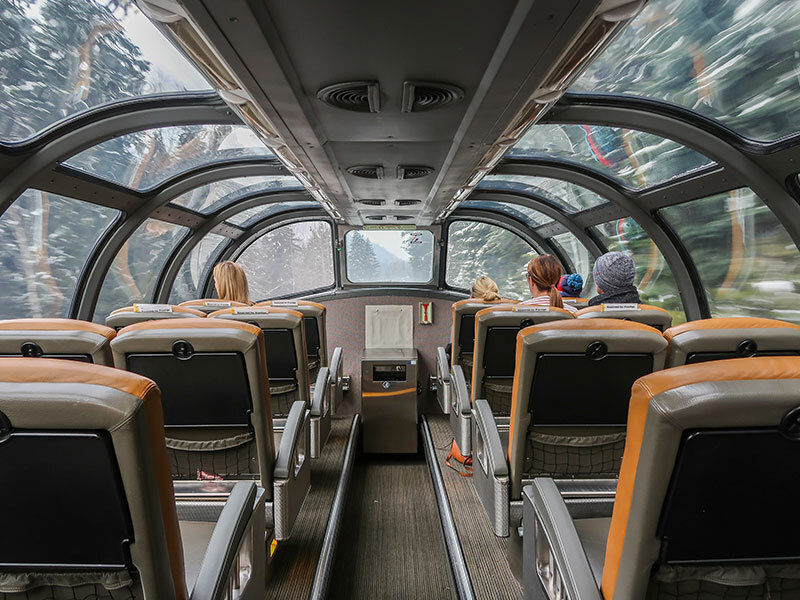 VIA Rail is a timeless experience that services the width of the country, and some of the most exciting sights fall within your overnight journey to Jasper. Rediscover the romance of it all from the dome or dining car, watching the land transform from grey to white as you fall further from the city. When the kitchen is ready for lunch and dinner service, make your choices from a menu and indulge in a delicious multi-course meal. Each one is made to order by a talented on-board Chef, and each outdoes the next in terms of flavor, presentation and quality. VIA is the only rail experience that offers accommodation on the train, and as evening settles in, your quarters are transformed. What was originally a seating room becomes a bedroom as attendants make up your bed and prepare your private space for the night. Some Sleeper Plus Class amenities include towels, pillows, cozy down duvets and a shower kit, and all rooms feature a window from which you can watch the world go by. Customize it: When booking VIA Rail, you'll have your choice of accommodation options. Choose between a semi-private sleeper berth or your own private bedroom. Both include all meals, snacks and non-alcoholic beverages, and have access to the Skyline car, Panorama car, Park car, Renaissance car and the Dining car. Feeling particularly fancy? Enquire about Prestige Class. Rockaboo guide Max belaying Canada by Design team member Stephanie as she ice climbs the Queen of Maligne. Rising to a winter wonderland outside your window this morning, the train pulls into Jasper just shortly after breakfast. We stayed at the Fairmont Jasper Park Lodge on this journey, and the shuttle from the lodge can pick you up directly from the station. Arriving at the Fairmont reveals an iconic Canadian experience. The main lodge houses reception, the spa, shops and multiple restaurants, while the rooms are found in cabins scattered strategically on the grounds. If yours isn't quite ready yet, store your luggage at reception and pay a visit to the Winter Activity Centre where you'll have access to skating, cross country skiing, snowshoeing, toboganning and fat tire biking. Prefer to relax? Grab a meal at The Emerald Lounge or ask the staff to set you up with s'mores at an outdoor fireplace! The following morning brings a full day of exploring the Jasper area. 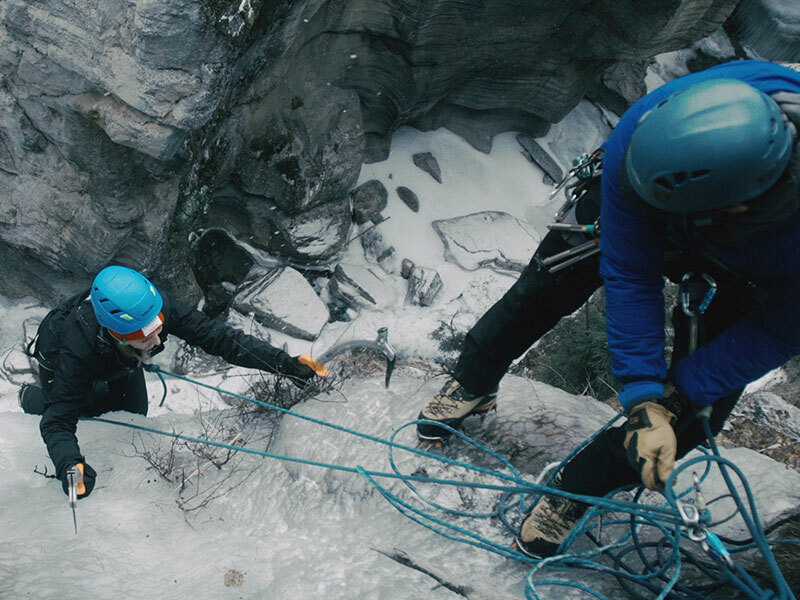 Rockaboo Mountain Adventures takes travelers ice climbing out at Maligne Canyon, and our guide Max put our first-time minds at ease with his expert knowledge and experience. Climbing a frozen waterfall is both challenging and rewarding – you really can't help but high five once you've climbed 100 feet to the top! Of course, all that climbing works up an appetite and what better way to reward yourself than with a food tour of the town? Estelle at Jasper Food Tours takes guests to four incredible local restaurants, doling out one delicious dish after the next along with an incredible wine or beer pairing. Even better, the tour includes stops at some of Jasper's most historic places, so you can learn about the town and its past while catering to your cravings. Customize it: While the Fairmont Jasper Park Lodge is our preferred partner, moderate grade accommodation is also available when you book. Ice climbing and a food tour come highly recommended, though plenty of other activities are also on hand. 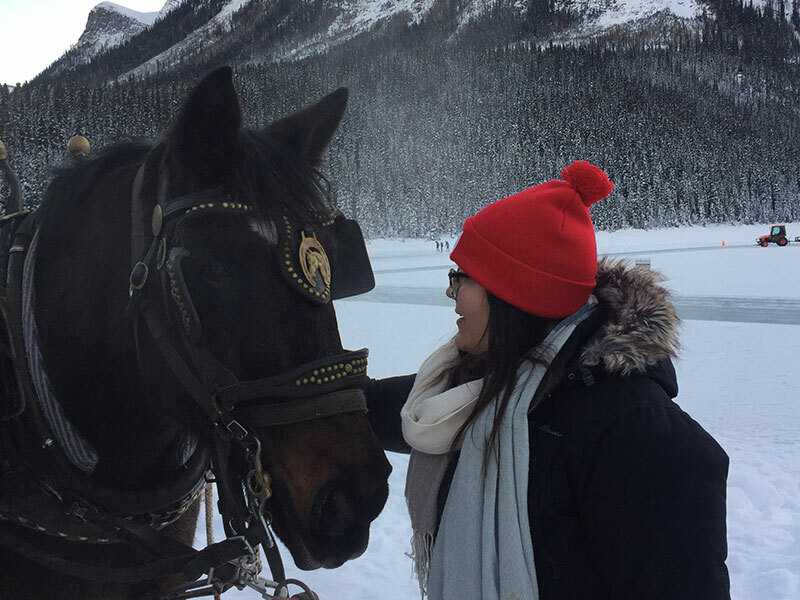 Canada by Design team member Samantha petting the horses at the sleigh ride. The following day, Sue from Sundog Tours met us at the lodge for a guided drive along the Icefields Parkway to Lake Louise. What's regarded as one of the most scenic highway stretches in the world does not disappoint, and the drive is smooth and comfortable in your private vehicle or bus with leather seats, blankets and outlets for phones and cameras. Watch for wildlife like elk and moose, and stretch your legs at various points along the way. The Columbia Icefield is an absolute must-do, providing the perfect photo backdrop for your iconic winter trip. Arriving to the next deluxe-grade property, Fairmont Chateau Lake Louise, it doesn't take long to be enchanted by the iconic lake found at its front. Skating is available through the majority of the season, and from January 19 to 27 there are impressive ice sculptures at its center. Warm up with afternoon tea at the Fairmont, then head back outdoors for a stunning sleigh ride around the lake. Brewster Adventures usually operates these from mid December to mid March, weather permitting. Customize it: While the Fairmont Chateau Lake Louise is our preferred partner, moderate grade accommodation is also available when you book. Want to squeeze in some skiing? Lake Louise Ski Resort is one of the largest ski areas in North America, and is included in the Ski Big 3 pass. White Mountain Adventures guide, Sam, leading Canada by Design team members Samantha and Stephanie snowshoeing. The next morning it's onwards to Banff, a small resort-style town with plenty to see and do. Arriving to Canada's "castle in the Rockies", the Fairmont Banff Springs Hotel is straight out of a fairytale, complete with endless halls, shops and spaces to explore. Drop off your things and don your warmest winter gear – up next is the Banff Gondola, and its exposed viewing deck can be chilly. Educational, informative and full of impressive sights, the gondola carries you up to three levels of interactive displays, dining venues and viewing decks. The rooftop area reveals the most incredible sights, spanning across six different mountain ranges and the sweeping Bow Valley below. Take a moment (or multiple) to soak it all in, then ride the gondola back down and head to Sunshine Village for your Top of the World Snowshoe experience. The title of this tour couldn't be more accurate, as you'll truly feel on top of the world surrounded by untouched snow and expansive nature. Up here, there's rarely other people in sight, and as your snowshoe falls on perfect powder you can't help but feel a smile creep across your face. White Mountain Adventures took us on this incredible half-day tour, and our guide Sam was equally passionate as he was prepared. Customize it: While the Fairmont Banff Springs Hotel is our preferred partner, moderate grade accommodation is also available when you book. Skiing is also accessible from here, or you can shop and dine your way through the picturesque town of Banff. Dinner at Park Distillery comes highly recommended! Canada by Design team member Stephanie walking through downtown Calgary. Heading towards Calgary today, a trip to the Rockies simply wouldn't be complete without a helicopter tour. Arriving at Rockies Heli, you'll feel butterflies in your stomach at the excitement of the ride. Lift off and fly high over towering mountain peaks, getting just close enough to see the different layers in the snow before landing in a valley for another snowshoe adventure with hot chocolate. 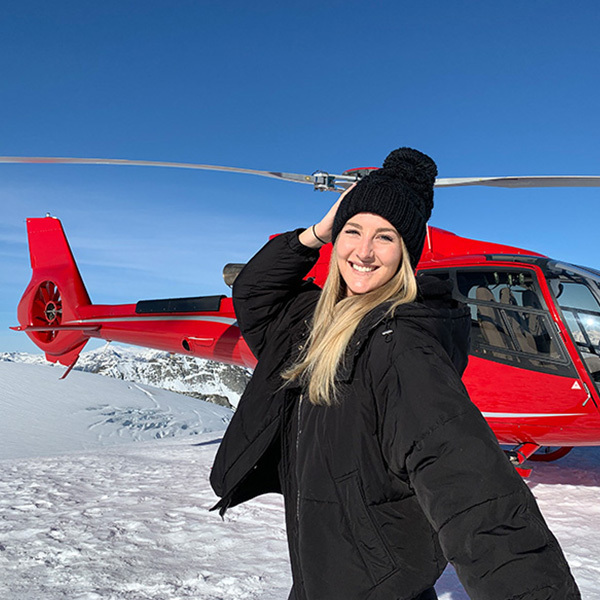 Fun fact: The Rockies heli base is located on Abraham Lake, famous with photographers for its surreal bubbles at the frozen surface. Returning to the base, Discover Banff Tours continues the transfer towards Calgary, stopping to explore Johnston Canyon on the way. This incredible canyon offers a different sight at every turn, requiring you to follow trails, walkways and catwalks to get to the frozen lower and upper falls. Our guide Anick provided studded soles to strap onto our shoes and kept a leisurely pace, allowing us to look around and stop as much as we wanted to capture incredible photos. As night falls you arrive to Calgary, known for its attractions like Studio Bell, Stampede (in the summer) and its up-and-coming food scene. The foremost is a brand new addition to the city, showcasing Canada's incredible music history across five floors of interesting and interactive exhibits. See real stage costumes, mix your own track or see what it's like to record a song in a sound booth – this incredible building houses an array of things to do and can keep you entertained for hours. 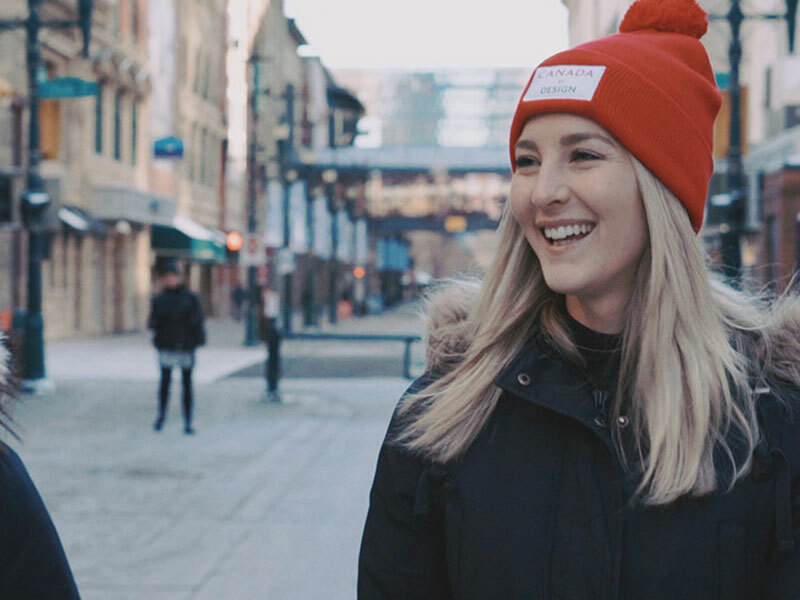 Customize it: If you've already experienced Studio Bell, take a food tour through the city or soak up views from Calgary Tower. Hotel Arts is a great home base for the night, and their very own Yellow Door Bistro serves up impressive dishes over dinner. Feeling inspired? Get in touch with one of our travel designers to customize your own magical winter experience. Prefer to simply stay in touch? Subscribe to our newsletter for up-to-date deals, trip ideas and more!